This Bavarian-Inspired Sandwich Is The BEST Twist On Classic Grilled Cheese! German food sometimes gets a bad wrap, which is completely undeserved – it’s delicious! In honor of our love for Bavarian cuisine, we whipped up a grilled cheese sandwich like you’ve never seen before. 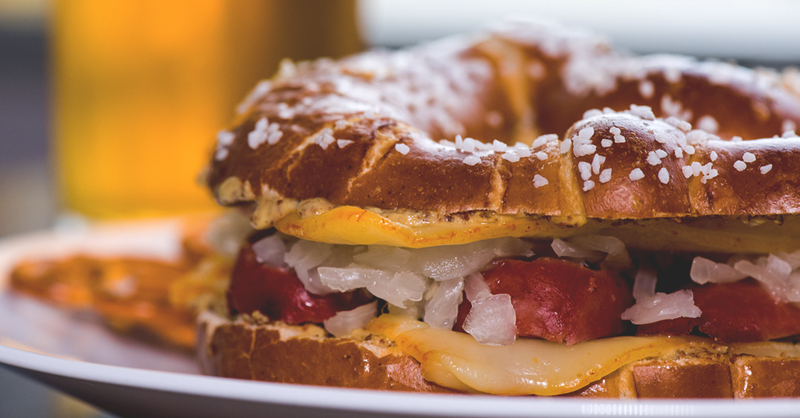 Starting with a soft pretzel, we loaded it up with classic German flavors, including mustard and muenster cheese, then grill each half open-face until the cheese starts to melt, and top it with sliced bratwurst and sauerkraut…. Yum! If you don’t want to worry about the cheese oozing out of the pretzel twist, you can easily substitute a pretzel roll (though using the classic pretzel shape was a big hit in our family). Either way, this grilled cheese is one of the most fun and interesting meals we’ve made in a while… give it a try, we bet you’ll agree! Preheat oven to 200ºF, and place a baking sheet inside, to keep sandwiches warm as you make them. Slice each soft pretzel in half horizontally to create a sandwich. Spread the cut side of each half with 1/2 tablespoon mustard, then place 2 slices of cheese on each half. Melt 2 tablespoons butter in a skillet over medium-low heat, and place 2 pretzel halves (crust side down) in skillet. Cook for 2-3 minutes, or until cheese starts to melt (not too melty though, or it will fall through the holes of pretzel). Remove from skillet. Top one pretzel half with 1 sliced bratwurst, 1/4 cup sauerkraut, and salt and pepper to taste, then close with second pretzel half. Place sandwich on cookie sheet in oven to keep warm. Repeat with remaining pretzels, serve warm with extra mustard for dipping, and enjoy!